I’m Looking Over A Four Leaf Clover is the top song in America and was typical of the big band styled novelties Art Mooney specialized in, often featuring sing-along choruses that were already decidedly old-fashioned by the end of the 1940’s. But the gimmicky throwback style was quaintly re-assuring to a segment of the post-war audience that was worried about the onrushing changes in American culture, which invariably included more aggressive music styles on the fringes of society such as bop and rock ‘n’ roll. A 1948 Cadillac coupe cost $2,900 ($3,400 for the convertible) and is the first car produced with tailfins, a design concept by Harley Earl, introducing what would become the distinguishing feature of car bodies for the next decade. His idea was rooted in the impending jet-age which promised sleeker, faster, more forward looking designs based on the growing importance of flight which symbolized a new era. He based the tail fins on the Lockheed P-38 Lightning fighters of World War Two with its twin engine design earning it the nickname Fork-Tailed Devils by the Nazis. 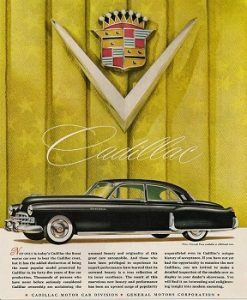 Though the 1948 Cadillac’s tailfins were minor compared to their later embellishments, peaking with the 1959 Cadillac, their mere appearance ushered in the most dynamic era of the automobile design. 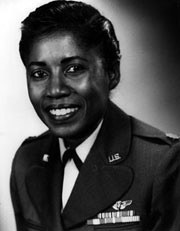 First Lt. Nancy Leftenant becomes the first African-American woman accepted into the Regular Army Nursing Corps. Leftenant served as an Elite Flight nurse for The Air Force when the military branches split, tending to wounded soldiers in the Korean War as well as in Japan, rising to Major during her time in the service. In later years she served as the only female President to date of The Tuskegee Airmen Inc.
Martin Luther King Jr. is ordained at the age of 19 at his father’s Ebenezer Baptist Church in Atlanta, Georgia. His grandfather had been its second pastor in the 1800’s and Martin Luther King Sr. had been installed as pastor in 1931 and would continue to lead its congregation until 1975, overseeing its ascent to one of the strongest and most community minded institutions in the south. Growing up the younger King had been uncertain of pursuing the ministry and had thoughts of becoming a lawyer, but following an incident of mild harassment by police while working harvesting tobacco as a summer job he decided on his future in the church. He gave his first trial sermon in the fall of 1947 and the congregation voted to ordain him soon after, with the official ceremony taking place February 25, 1948. The next fall he attended Crozer Theological Seminary, a progressive integrated school where he excelled, the chapel for his student sermons being packed with fellow students to hear him speak even then. Upon receiving his bachelor’s degree, rather than return to Georgia and start his career as was expected, he attended Boston University where he met future wife Coretta Scott and earned his doctorate. King eventually was made co-pastor at Ebenezer in 1959 from whose pulpit he led the Civil Rights movement until his murder in 1968. A rather downsized Winter Olympics is held in St. Moritz, Switzerland, as the first post-war games is dubbed “The Games Of Renewal”. Germany and Japan were excluded from the Olympics for war-related reasons, while The Soviet Union declined to participate. 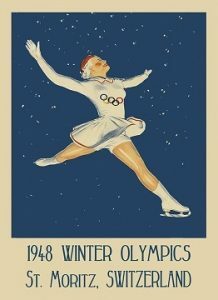 The Games were held entirely outdoors which caused some unique problems, such as a low flying plane interrupting Barbara Ann Scott’s gold medal winning figure skating performance on a badly damaged ice surface due to prior hockey games also held there. Norway, Sweden and the host country Switzerland won the most medals, at 10 apiece. NASCAR is incorporated in Daytona Beach, Florida by Bill France to organize what had been a loosely connected group of amateur stock car racing enthusiasts. 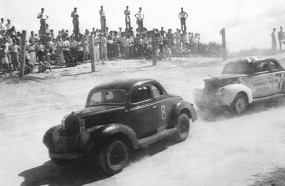 Ironically the first year stock automobiles weren’t used in competition due to the demand for new cars following World War Two when automotive production had been halted entirely, so the initial year featured the Modified class of cars with the first NASCAR sanctioned race won by Red Byron on the half sand, half hardtop oval track at Daytona Beach, February 15, 1948. Though its appeal was centered almost exclusively in the south where drivers had long been running illegal moonshine in fast cars to evade law enforcement, by the 21st Century the NASCAR is the second most watched televised professional sports competition in America. Thinking about enjoying the winter weather rather than complaining about it? Skiing is having a surge in popularity across America, seeing its ranks swell over the previous decade from only a handful of outdoor adventurists to more than three million participants. 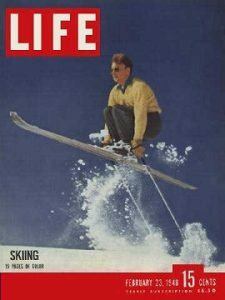 Ski lifts, which fifteen years earlier hadn’t existed, now number over a thousand allowing more amateurs to take up the sport with a minimal of skills required and consequently ski lodges sprang up over the northern country locales and are filled from November to March. With an average cost of just $80 a week for a ski vacation, $2 for lessons from qualified instructors and lots of socializing in the lodges after their runs, skiing is fast becoming one of the booming leisure time activities enjoyed by an increasingly prosperous American worker. 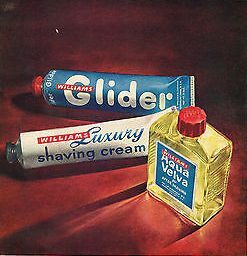 Men’s shaving products: Aqua Velvet and Williams Luxury Shaving Cream (or Glider “No Brush” Shave if you prefer) regularly costs a dollar! But you can now buy the bargain combination pack and save 25% and get any two for just 75 cents… but they warn you supplies are limited.